The LRI Centre is a central school resource for both staff and pupils. It is open from 8.30am to 4.15pm every day, including break and lunchtimes and is staffed by a team of Sixth Form pupil librarians and Sixth Form Supervisor Miss McAndrew. Mrs McNeill is the Teacher Librarian. There is a large collection of both non-fiction and fiction books on a variety of subjects. Junior pupils can borrow 2 books and 1 DVD and Senior pupils 4 books and 2 DVDS (2 week loan for books, 1 week for DVDS) and are welcome to use the computers on site. There are board games available at break and lunchtime for Year 8s and Year 9s and we run various competitions at different times of the year with prizes for the winners. Students are encouraged to use the library for DEAR(Drop Everything And Read) and Accelerated Reader. 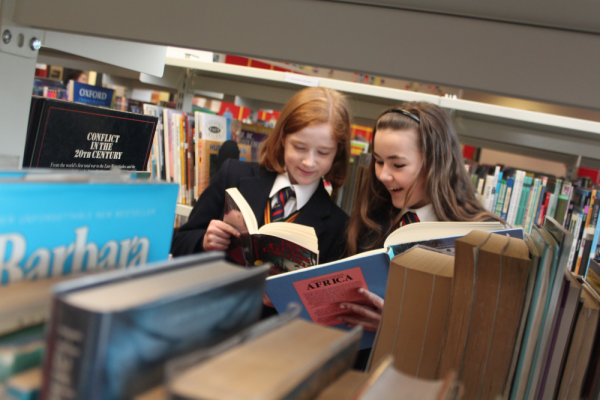 Year 8 classes attend the library on a weekly basis during their DEAR time. The library is also used for storytelling events and talks from visiting organisations and is generally a nice place to visit and to use for quiet study. Please call in and have a look if you are passing by.